← From where he lay he had been able to see those two great rocks called the Faraglioni which stand out at sea. It was full moon and he must have gone to see them by moonlight. Perhaps he died of the beauty of that sight. In the next land we found were Cyclopes, giants, louts, without a law to bless them. Tonight you should reread “The Cyclops” on pages 986-999 in your green literature textbook. Then, please respond on the blog. We talked quite a bit at the end of class today about Odysseus’ characteristics, and what they tell us about what it meant to be a hero in ancient Greek culture and today. This evening, let’s think about what they did not value. Please paraphrase the opening lines to this section, (p. 986, lines 109-120). To paraphrase means to rewrite in your own words precisely what was said in the text. This is not a summary or an overall understanding. A paraphrase is really like a translation into your own words. After you paraphrase the speech, please explain the significance of this description and how it relates to cultural values then and now. Please be sure to consider other parts of the text as well. Posted on February 1, 2018 by equinson	• This entry was posted in Mythology. Bookmark the permalink. The opening lines in the story sum up the life of a Cyclopes. “…without a law to bless them…they neither plow nor sow by hand, nor till the ground, though grain-wild wheat and barley-grows untented, and wine-grapes, in clusters, ripen in heavens rains. Cyclopes have no musters and no meeting, no consultation or old tribal ways, but each one dwells in his own mountain cave…(pg.986 lines 110-118)” The Cyclopes have no meaning in life. They just have their sheep and eat them. All they do is tend to the sheep. The grains and vines grow freely and the Cyclopes don’t plow, sow, or till. They don’t socialize with each other. If one calls for help the others will come but other than that they don’t care what the others do. The cultural of the Cyclopes…well there isn’t one. Unless a culture is doing nothing. This goes back to how Wilson lived his life. The Cyclopes are like him in a way. They just live there life in leisure, not doing anything for anybody else. They could be considered selfish. Now a cultural like this wouldn’t be expected. It also isn’t around very much if at all. Most people have a job and work for other people. No one can sit in there cave and herd sheep all day. This also shows us how Odysseus is a hero. He fights in a war and then hurdles multiple obstacles to get back. The cultural of the Cyclopes would not be accepted today. I agree that the cyclopes have no culture. It is hard to talk about them when all they do is sit around and eat. I agree, and I wonder if that’s why they are often referred to as just a race instead of a people because the have no common culture. I agree Matt. I think that is an interesting point. I mean, they are so different both mentally and physically. I mean come on, they have one eye! On page 86, we see the opening to the story of “The Cyclops” from the Odyssey. Lines 109-120, the very beginning, give us some background on the land of the Cyclopes and who they are as a people. Homer starts, saying “In the next land we found were Cyclopes/ giants louts without a law to bless them.” (page 986). He then goes on to talk about Cyclopes characteristics. They don’t work the land, or try to farm in any way. Instead, these Cyclopes live off of wild grains-wheat and barley-that naturally grow off of the island, as well as some wine grapes. These monsters, Homer tells us, also are uncoordinated. They have no real common way of living or government, but instead live isolated from one another in their own mountain cave, with a wife and child. Finally, they don’t care about outsiders, and only do things for their own survival and well being. I think this passage is invaluable to the rest of the text and the Odyssey as a whole. These few lines not only give us some background to the Cyclopes, but also show us which way the story is going. It tells us that Odysseus will in some way encounter these people and go on some form of an adventure. Personally, I find the Cyclopes to be selfish and disgusting creatures, and I think this was the intended view that Homer was trying to go for. For instance, he says, “but in one stride he clutched at my companions/ and caught two in his hands like squirming puppies/ to beat their brains out, spattering the floor./ Then he dismembered them and made his meal,” (page 989). By making the Cyclops more grotesque, it seems as if it makes Odysseus more righteous in that he is trying to deter these monsters. Overall, I think that Homers opening to “The Cyclops” is very important, yet the perception of the cyclops itself was dome so purposefully to both add to the story and make Odysseus seem more heroic. The opening lines to “The Cyclops” are “In the next land we found were Cyclopes,/giants, lotus, without a law to bless them./In ignorance leaving the fruitage of the earth in mystery/to the immortal gods,they neither plow/nor sow by hand, nor till the ground, though grain-/ Wild wheat and barley- grows untended, and/wine-grapes, in clusters, ripen the heaven’s rains/ Cyclopes have no muster and no meeting,/ no consultation or old tribal ways,/but each one dwells in his own mountain cave/dealing out rough justice to wife and child,/indifferent to what others do…” (Pg. 986, Lines 109-120). This passage is pretty much just explaining what the cyclopes do in their day-to-day life. They just live off of the sheep they heard and wild berries that they find. They pretty much have no culture to look into, they live carelessly. I think that they cyclopes are pretty selfish. All they do is try to eat humans and sheep. They only socialize for food or when someone trespasses them. I saw some of Wilson in them. Wilson also lived his life carelessly, just not to such a degree of the cyclopes. In a blog from a previous night I talked about how Wilson lived carelessly, but I think that deep down he lived with the weight of knowing that he would run out of money. I was thinking, what if the cyclopes have something deep down to worry about? I don’t know much about cyclopes in general so I wouldn’t know, but if I did know I think it is an interesting idea. I feel like since the Odyssey is such an important writing in literature that there must be a deeper meaning to the cyclopes other than using them to characterize Odysseus. Nice job, Hailey. Interesting theory, I wonder what the Cyclopes could also represent in the Odyssey. barbarians, without any rules to favor them. grapes, in clusters, ripen in the rain. This description of the Cyclopes attempts to explain how uncivilized they were. They had no laws or rules, no knowledge of farming or agriculture which could have benefited them greatly, nor any human contact between each other. They only dwelled in their own homes and abused their family. Compared to today, it’s like they live in an opposite universe. In our time period, we have many laws, thousands of them even. The main source of our food also comes from our farms, in contrast to the Cyclopes. Furthermore, socializing in our culture is almost a need. We need to interact with other human beings frequently. And for the most part, abuse, of family or anyone else, is highly looked down upon. Overall, ancient Greece was a much different place than today. Great job! I agree with you, the Cyclops are a bit uncivilized but I think it is all because of how independent they were. Also, I agree with you that the standards of a hero is different than it used to be. Keep up the great work. The first few lines of “The Cyclops” in the literature textbook describe the life of a cyclops. “In the next land we found were Cyclopes, / giants, louts, without a law to bless them,” (ll. 109-110, p. 986). This is saying that the Cyclopes have no lawless, which makes them kind of crude and unrefined. “In ignorance leaving the fruitage of the earth in mystery / to the immortal gods, they neither plow / nor sow by hand, nor till the ground, though grain— / wild wheat and barley—grows unattended, and / wine grapes, in clusters, ripen in heaven’s rains,” (ll. 111-115, p. 986). This part is again saying that they are unrefined. They don’t grow any crops themselves, but rather leave it to the gods to grow their crops for them. In a way, the Cyclopes are being depicted as lazy. “Cycloped have no muster and no meeting, / no consultation or old tribal ways, / but each one dwells in his own mountain cave / dealing out rough justice to wife and child, / indifferent to what others do,” (ll. 116-120, p. 986). This, again, makes the Cyclopes seem uncultured. These lines show that the Cyclopes have a lack of organization, and instead they all live their own individual lives, separate from others. It also portrays the idea that the Cyclopes are harsh because it says that they beat their wives and children. In the end, lines 109-120 are just summarizing the life of the Cyclopes, but in such a way that they seem primitive. Great Job, Arjun! You did a great job explaining your points with superb analysis. Keep up the great work! In tonights reading of The Cyclops, in the green literature textbook, we learn a lot about the characterization of the Cyclopes. Throughout the story, the word “afield” is often used while describing the Cyclops’ actions. After searching up for the definition of it, I found out that it meant at a distance. In other words, the Cyclopes kept their distance and were found to be very independent. The story also mentioned, “Cyclopes have no muster and no meeting, no consultation or old tribal ways, but each one dwells in his own mountain cave dealing out rough justice to wife and child”. This brought my attention because it shows how Cyclopes aren’t social, but instead, they like spending time with their family at home. This has many similarities and differences to Odysseus. In the Odyssey, Odysseus saves his family and doesn’t want to leave them, this is very similar to the lifestyle of the Cyclopes. Although they are very similar, no two things are exactly the same, which leaves room for their differences. A difference between the two is that once Odysseus is out of his hometown, he is adventurous and likes to explore. At one point in Odysseus’ journey, he meets a woman and tells her his story. Than, Odysseus somehow becomes “famous”. This seems like something a social person would do, which is the exact opposite of what the Cyclopes did. To conclude, both Odysseus and the Cyclops show a bit of their personality through their actions in which are both very similar and different. In the introductory lines of “The Cyclops,” we the readers, are given background information about the land of the Cyclopes as well as the characteristics of those inhabitants. “In the next land we found were Cyclopes, giants, louts, without a law to bless them,” pg. 986). The Cyclopes are cultureless and portrayed as very lazy. They did not work on the land or farm but instead survive off of sheep, wild grains, wheat, and barley that naturally grow on the island. In addition, they consume grapes, used for making wine, that were also grown naturally. These monsters are uncoordinated, and lacked a basic government or organized society, making them uncivilized. “Cycloped have no muster and no meeting, no consultation or old tribal ways, but each one dwells in his own mountain cave dealing out rough justice to wife and child, indifferent to what others do,” (pg. 986) The monsters live isolated from each other with their wives and kids, and don’t care about invaders. They only care about their own well being and necessities of survival. They have no culture whatsoever and are very selfish, by caring about only themselves. Similarly, Wilson was also very selfish in choosing to stay in England, despite the loss of his annuity. Wilson expected to survive without money or doing anything, similar to the Cyclopes. It is evident that the Cyclopes were used to make Odysseus seem more heroic, and add to this story. Furthermore, Homer’s introduction to “The Cyclops” is very significant and important to the story. Great analysis, I agree that they only care for their own well-being. I really liked how you paraphrased the opening lines. I completely agree with your opinions. Great work Ajay! In lines 109-120, Homer describes the life of a cyclops. He describes them as huge monsters that live by no rules. They don’t care what happens to their land even though it has crops such as grain, wheat, barley, and grapes. Cyclopes live in isolation, away from one another and never speak or try to communicate with each other. The cyclopes have no religion or beliefs. They live with their sheep and do nothing all day. By describing cyclopes this way, Homer leads us to believe that cyclopes are pure monster and have nothing human in them. Everything in their description goes against everything that we humans do. We have rules, we farm, we communicate with one another, we have religions, and we work. The cyclopes have everything the opposite. The description shows that cyclopes are nothing like humans, they are monsters, and should be treated as such. Homer is trying to make readers feel more comfortable about Odysseus killing him. Not that we don’t hate the cyclops already for bashing the brains out of two crew members, but I think that Homer wants to make sure that we know that cyclopes are pure monsters and deserve to die. He wants us to have no pity on them because of what selfish and vile creatures they are. They don’t talk to one another, they don’t have a religion, and they don’t have any rules or guidance whatsoever. They have nothing that even makes them similar to humans, which is why Homer wants us to think it is ok to kill them and not feel bad about it. Odysseus should have all of our pity and support, and all of the monsters that challenge him should be overlooked as obstacles that our hero will defeat. The opening lines to “The Cyclops” are “In the next land we found were Cyclopes, giants, lotus, without a law to bless them. In ignorance leaving the fruitage of the earth in mystery to the immortal gods, they neither plow nor sow by hand, nor till the ground, though grain- Wild wheat and barley- grows untended, and wine-grapes, in clusters, ripen the heaven’s rains Cyclopes have no muster and no meeting, no consultation or old tribal ways, but each one dwells in his own mountain cave dealing out rough justice to wife and child, indifferent to what others do…” (Pg. 986, Lines 109-120). What this all means is that first of all, the Cyclopes are lonely and have pretty much no life. Because the Cyclopes were not smart enough, they did not plow the land but instead let all the plants and crops continue to grow. However, they all live in their own caves and are very cruel. This all shows the awful nature of the Cyclopes. They are stupid, lonely, cruel and unwanted. All they do is herd fat sheep. The only things they do do is eat sheep and trespassers. Honestly, they had no culture. They were just savage giants who practically had no life. Because of how Cyclopes are described, it makes Odysseus look even more heroic. Odysseus beats the savage and ignorant Cyclops with his cunning and intelligence. Great summary, I like your analysis and the way you related Odysseus to on the way the Cyclopes’ culture was described. Great job, keep it up! The first lines of the story give background on what the Cyclopes do in their everyday lives. They basically do not do much of anything for anybody else, and usually only sleep and eat. They also tend to their sheep, and care for them a lot. The Cyclopes never really meet with eachother to discuss rules, but do come and help each other when one of them is in trouble. They just live in their individual caves, and their lives are centered only around themselves. The Cyclopes never try to grow their own food or farm anyway. They just live off of the food that naturally grows on the island. The fact that the Cyclops that Odysseus and his men were trapped with carelessly decided to eat some of them shows that the Cyclopes do not care about anyone else besides themselves. They only care about eachother, and even then do they only help eachother when one calls out to the rest. The Cyclopes are very self-centered, and really only think about themselves. They live isolated from each other, they tend to their own sheep, find their own food, and just eat and sleep most of the time. The first few lines of The Cyclops states the culture and characteristics of Cyclops. Cyclops have no meaning in life. They tend their sheep, kill and eat. Cyclops does not work on the fields, they just eat what naturally grows on the island. They do not communicate with other beings and only stays in their cave. Cyclops only care about their own well-being rather than socializing and helping others. The significance of these first few lines is to show that Cyclops are not a “species” that have specific values and goals. It is really hard to talk about their culture when they really don’t have one. All they do is sleep and eat. However, I really do think that Cyclops are important and represent something. They also may have other feelings that we don’t really know about. Good response! I honestly think that Cyclopes are significant, and also you have to remember that this being spoken through Odysseus currently, not the author. Reading the “Cyclops” during class today brought forth a lot of topics to talk about. First, the Cyclopes seem to be a independent civilization often judged by others, always trying to be defeated by every “hero” that comes around. The text says, Cyclopes have no muster and no meeting,/ no consultation or old tribal ways,/but each one dwells in his own mountain cave/dealing out rough justice to wife and child,/indifferent to what others do…” (Pg. 986, Lines 109-120) They’re not afraid of being different even though they’re not the greatest creatures in the world and the fact that they are monsters. However, Odysseus isn’t the greatest person in the world either. Everyone says, he did his best to save his crew members and he tried to get home to his family. There is a mutual understanding of the fact that Odysseus did suffer for a good period of time and that he is in some ways a hero. However, there are still aspects of him that are not very enjoyable. He is prideful, ignorant and arrogant. He always finds a way to prove himself or just prove that he’s the best. I mean, we get it. You’re a war hero. I just find that he doesn’t mean to brag but he does. However, he still is a honorable hero that fought for his country. Today in class and this evening, we read a section of The Odyssey by Homer about the story of the cyclops. The opening lines talk about how the cyclopes live without any meaning in life. They eat, sleep, and torture humans, without any laws to abide by. “Cyclopes have no muster and no meaning.” They herd sheep, and basically just stay in their caves feasting on innocent people. I immediately thought about The Lotus Eaters because of the selfish and lonely ways of both the cyclopes and Wilson. I was thinking about how this is such a sad life, and I realized that the cyclopes were ignored and hated because of their looks. This might be the reason they feel they have no purpose and simply lounge around all day. Maybe they are eating humans out of spite or revenge. They text stated. “But you are mad, unbearable, a bloody monster! After this, will any other traveler come to see you?” The cyclopes were seen as the outsiders, the monsters of the world. This is significant in culture then and now because it shows how being secluded and shunned in society can take a toll on a creature. No matter what, seclusion is not good for anybody, and it is no wonder that the cyclops eats humans and Wilson went mad. The cyclops and Wilson could be seen as selfish and lazy, but this is probably because of loneliness. In all, I feel bad for the cyclopes, and how they are hated in society. They aren’t the nicest creatures, but I can see why. This was a great response Patsy, I really liked the points that you chose to make in your blog. Great Job! In these opening lines, Odysseus is making himself look like a hero. He describes the Cyclopes as lawless rapscallions. They do not follow or accept the all-knowing gods. The Cyclopes don’t care of their land and let their food and grain grow wild. They have no organizational meetings between the race. They are just are a bunch of useless hooligans. No government or anything that resembles one. The Cyclopes are unfair to their family and don’t care about their family members. I for one, believe that the Cyclopes are sometimes misunderstood. First off, Odysseus could still be angry at the Polyphemus for attacking him. Even if Greece had a sacred law on the treatment of strangers who ASK to be taken in, there is no law on people who brake in and steak your food. I would be livid, especially about them stealing my food. I feel that the Cyclopes aren’t as bad as we think they would be. I mean, I don’t blame Polyphemus for questioning the people who broke into his home. I believe that there is more to the Cyclopes than just the brainless brutes that Odysseus paints them as. As for the way the Cyclopes would be treated the nowadays, I would say not that differently. People are even more judgmental nowadays and make people who are different feel like a disgrace to society. I feel that this all comes down to how people conform to society. Aside from the Cyclopes being man-eating giants, I feel that them being different makes people uncomfortable, and they don’t want to accept the fact that the Cyclopes are not the same as them, and make them feel dishonorable. Overall, the way the Cyclopes are painted does not give them a chance to show the what they really are, without Odysseus’ angry remarks on their society. The Cyclops were not a prepared kind of group or creature, they had no feeling of coordination or organization and were very scattered people. Yet, they all stand together as a group and they trust each other. They have families, children and wives, and are very close with each other. This is something common for a group who aren’t very normal, yet they do many things that others do not. They don’t seem to care about what other people think, they just live their lives how they want to. The writing of The Cyclops explains their culture and how they chose to live their lives on the daily. They know what the gods and mortals think of them, yet they don’t change their ways or how they act. Cyclops have been judged for their entire lives and have put up with being treated, whether they deserved what they got or not. Their lives remained their decisions and were full of their own choices because that was the way they wanted it to be. I think that in a way we could all learn a thing or two from the Cyclops and their life choices because as humans, we tend to care what others think of us and change ourselves because of that. Now we definitely, shouldn’t take everything that the Cyclops do as an example for our own lives, not everything they do is something to marvel at, but in this case they are correct. What others think is not important, being happy is, and people need to remember that more than they do. Ryan, I really like your point at the end, where you say that a lesson to take from the Cyclopes is to not care what others think about you and to not forget about your own happiness. While I think that bashing in men’s heads and then eating them is a slightly extreme version of pursuing your own happiness, I do see where you are coming from. One thing at the beginning of your response that I don’t think is completely correct is when you mention that the Cyclopes didn’t “sew.” When the text states, “they never plow nor sow by hand,” I’m fairly certain that to sow is another way of working the land, like plowing. This isn’t super important but I thought you should know. Great response though! After rereading the Cyclops on pages 986-994 I have thought differently about the opening lines. The opening lines discus how cyclopes don’t have a law and don’t farm the soil but still manage to grow grains. They live in a cave with their family and in isolation from other families of Cyclopes. This beginning gives a detailed description of cyclopes. Cyclopes are similar to a primitive society with little interaction to the outside world. The introduction mentions their limited farming as “In ignorance” since the Cyclopes don’t have cultural diffusion with the outside world they don’t know what they’re missing in agriculture or society. They live without purpose nor interaction with each other because this is the only way they know to live. Furthermore, the Cyclopes haven’t even developed far enough to have a government or even town meetings. Overall, I believe we can classify the cyclopes as barbarians or savages since they live in a lawless, underdeveloped, and uncivilized town. If Odysseus or any of the crew of his fleet knew of the barbarity of the cyclopes maybe they would not have landed them for food or supplies because cyclopes are so isolated that they do not even know or acknowledge the custom of greeting your guest. When living isolated on an island or in other areas it is easy to forget or be overwhelmed that we are part of a bigger world, but it isn’t good to ignore that world entirely. I like your blog. It it is interesting to see how you both acknowledge that cyclopes have no purpose, but then say they are important. Overall, I agree with what you say and think the last line about the cyclopes feelings took a look at this from a different angle. In the opening lines of The Cyclopes, p. 986 Lines 109-120, Odysseus encounters a land full of Cyclopes. He says that Cyclopes are huge, aggressive monsters with nothing to help them. They pay no attention to the riches of the earth, leaving it to the gods to give them the care never given to them. He says that Cyclopes have no sort of civilization, and they are just independent dealing with only matters residing with them and ignore any other problems. Basically, he is saying that all Cyclopes are useless and never contribute to society. I, for one, think that this statement is false. During the Titans War, the first three original Cyclopes supplied the three gods Hades, Zeus, and Poseidon with weapons to defeat Kronos. In fact, the other group of Cyclopes, which are sons of Poseidon, became herdsmen or shepherds, like Prometheus. I would also like to point out that even though Odysseus is supposedly wise, he was quite stupid to diss a son of Poseidon, the sea god, when their only way of travel was through boat. If he did not stop by the land of the Cyclopes, they probably wouldn’t have lost his crew or their ship. Great response, Abigail! You made a very good argument in saying that Cyclopes actual do have a use to the world, and the evidence you provided really backed up your thinking. Great job! The beginning of “The Cyclops” goes as follows. Odysseus and his crew stumble upon a land where Cyclopes dwell. These monsters do not abide by anyone’s rules, and they do not groom the plants of Earth. The Cyclopes follow their own rules owing to the fact that Cyclopes don’t acknowledge their neighbors, and they remain secluded in their own caves with their families. Unlike other characters in the epic “The Odyssey,” the Cyclopes have no “real world” responsibilities. Their jobs are to tend to their sheep and ram, and stay at home. While these are real jobs, these tasks simply do not measure up to the responsibilities of the mortals in the epic. The humans have families that have to feed. They are merchants. They have to go out and fight a huge war for the honor of their country and family. Cyclopes refuse to leave their homes, and they take no pride in even harvesting in the plants on their island, let alone fight for it. Because of this isolation, they don’t experience religion, or have a culture. There are no rituals or customs to inspire them or to celebrate. The only time faith is shown is when Polyphemus screamed to Poseidon to attack Odysseus’ ship. Perhaps long ago, these had been the values of a larger sum of people, but now, it is simply unimaginable to have no beliefs or purpose. Some people dedicate their lives to their own faiths, and others find content in having no beliefs at all. Some people spend time with their families, and they prepare meals and care for them, while others are constantly working to provide for themselves, so they can have the life they desire. Some watch the stars at night, and others watch Gilmore Girls. Everyone is varied in modern day, no two people are alike, because of our values and priorities. The cyclopes did not have a culture, or a real society with government or faiths or education. Everything was for themselves, and I think that they were selfish. The next land we came to was that of the Cyclops, the giant and lumbering fools who live with no law or culture. They do not worship gods, they let the reason for their fruits and crops go unexplained, not even giving a second thought to till and plow their fields. They have no community, except for the occasional run-in with another, and have no old ways. Each Cyclops lives with only it’s Immediate family, mercilessly beating its family without care for others. The significance of this is that it gives us the justification of the way Odysseus treated Polyphemus. By portraying the Cyclops as a horrid, terrible, and mindless people who don’t have any customs. In a way, Homer justifies the stealing and mutilating of a person by stating that, that person didn’t live by his attacker’s customs, so the attacker was justified. For Polyphemus, he is merely surviving by killing the humans, it is the only life that he has ever known. These men who entered his cave and requested him to give them board and food were simply his next meal. The opening lines of “The Cyclops” did the cyclopes justice. Describing well how the habits of a cyclops, the lines show you how unorganized their entire life must be. It is obvious that one of their favorite activities is hanging around in their cave. Clearly, they have no value in maintaining the land or keeping the place neat. Instead, they prefer only doing what they must in order to survive. Another passion of theirs is herding a flock of sheep. These sheep they use to feed themselves and do no harm to anyone or anything around them. Without a doubt, they are not the most interesting creatures, and as of now you would assume that they are more passive than aggressive. But instead, the cyclops decided that he would eat a few of Odysseus’ crew members. The group never wanted trouble in the cave. They simply wanted food and drink. However, the cyclops decided that he did not want any visitors. This shows the lack of courtesy in their culture. If a stranger went to your house at those times and they asked for a place to stay, you would provide food and shelter for the night. On top of that, you would help them prepare for their travels on the road by giving them food for the trip. These events show how uncivilized they are altogether. Perhaps if Polyphemus had been kinder to his guests, he would not have lost his flock and been blinded. Had he not been blinded. Had Odysseus not blinded him, they would have had a smooth and safe trip home. To more or less restate it, the introduction to the textbook’s version of the Cyclops begins by describing the Cyclopes’ lack of any mobilizing characteristics whatsoever. The author describes that they are more or less uncivilized, but powerful brutes, who live in isolation herding the fat sheep or harvesting their plump grapes that grow lusciously in their wild fields. This highlights possibly the greatest difference between ancient Greek and modern culture. In ancient Greece, honor was by far above all else. The Cyclopes demonstrate the Greek belief that success is pointless and worthless without work and honor put into it. This is especially emphasised in The Lotus Eaters, when the men wanted to waste their lives in blissful ignorance, throwing away any honor and responsibilities. In modern culture, while stealing and other crime is still frowned upon, there is noticeably less emphasis on honor. Today, it is more important to work hard in order to be successful, rather than fighting for it honorably at every corner. In the opening lines of page 986, there is a rather negative description of the Cyclopses. Homer, makes it quite clear that the Cyclopses are not to be pitied and that they are the antithesis of what a good Greek stands for. The Cyclopses reside in their own caves and don’t see each other and are a solitary people. They lack good family lives and have no common control that unites them together. They have nothing to share and don’t support each other. Through Odysseyeus we see that that juxtaposes the Greek ideology completely. Odysseyeus is the ideal man and he has a strong sense of family and he always supports those who need his help. The Cyclopses are selfish and Odysseyeus is selfless. The Cyclopses reluctantly come when Polyphemus calls them and clearly aren’t interested in helping him but Odysseyeus in the other hand, would jump at the chance to save someone in need and would do whatever it takes to get them to safety with few casualties. The Cyclopses stand for nothing when Greeks should stand for everything. They’re selfish and solitary, but through Odysseyeus we can see that heroism, selflessness and bravery are valued in Grecian culture. That’s problem why the Cyclopses are so terribly cast out. They don’t adhere to Greek cultural ideals but have no culture of their own to unify them or to live by. Their lost souls living in monoty. They have nothing to care about or stand for that’s important, everything they’d fight to protect is for a selfish reason. In the opening to The Cyclops, Homer is describing the creatures and giving context to Odysseus’ adventure that will follow. In my own words, it says that the Cyclopes are a very rough group of monsters who don’t have any form of government or order, who don’t work the land in any way and are of no purpose to the the gods, and are very independent from each other and don’t care what the others think of them. When the text says, “Cyclopes have no muster and no meeting,/no consultation or old tribal ways,” it means that they don’t have any real culture or society, and that they really don’t matter in any particular way. They don’t benefit anyone except for themselves, and do so by killing and eating heroes. I would say that the only slightly humanizing characteristic that they have is their love for their sheep and other livestock. It seems to me that they treat them well, letting them graze every day and milking them regularly. The Cyclopes display several values that are very different from ones we have today, such as only caring about your own affairs and happiness. Today, we live in a society that is very aware of what other people think about us, and that cares way too much about others’ opinions. I’m not saying that we should adopt all of the tendencies held by the Cyclopes, but caring less about what other people think would do us all some good. I know that other people made this point as well but I thought it was worth mentioning. In the first few lines of TheCyclops it mentions “In the next land we found were Cyclopes/ giants louts without a law to bless them.” (page 986). 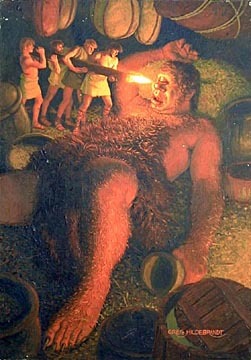 The Cyclopes are visioned by Homer as a species that are somewhat uncivilized. They do not work their own crops or agriculture and they just tend sheep to eat them. They depend on the gods to provide for them and thus make them inconsiderate and lazy. The Cyclopes are isolated and only come together in times of needs. They don’t go kindly to strangers as shown in the epic when the cyclops would pick out Odysseus men and eat them.“but in one stride he clutched at my companions/ and caught two in his hands like squirming puppies/ to beat their brains out, spattering the floor. Overall it doesn’t show any weakness in the Cyclops themselves but I’m sure that deep down their is a weakness or maybe even compassion.